The European Commission will fund a new international collaboration between UCF and Kaunas University of Technology in Kaunas, Lithuania, thanks to an exchange agreement signed recently. UCF students and faculty and staff members may now apply for financial support to visit KTU to learn, teach and network, and members of KTU may apply for support to visit UCF for the same purposes. Student applications for this fall are due June 1. The exchanges are part of Erasmus+, a program established by the commission in 1987 to provide enrichment opportunities for college students, faculty and staff members, and organizations. Erasmus+ previously had been an exchange program only for universities in Europe. The program changed to allow for universities in the United States to participate as well, according to public administration Professor Thomas Bryer, a former Fulbright Scholar and currently visiting professor at KTU instrumental in developing the agreement. “Though we are not the first in the U.S. to sign an agreement for Erasmus+, we are one of the first, and we are breaking new ground for UCF in developing international partnerships,” Bryer said. The new agreement permits UCF and KTU to send up to two students per year for up to two semesters each to study at the partner university. This summer UCF will welcome doctoral student Ieva Aurylaitė as the first KTU student to visit the campus through the exchange program. She will study under the supervision of Bryer and focus on local government communication with citizens using social media. UCF faculty members may visit KTU for one week and develop an agenda that aligns with the interests of KTU faculty members and students, primarily in the social sciences, arts and humanities. UCF staff members may visit KTU for a week for professional development and training. Erasmus+ pays a travel allowance to students plus monthly living expenses. Students can spend the allotment as they wish, choosing to stay within the fixed budget for living or using it as a subsidy. The same applies for faculty members who visit for one week at a time. Also underway are plans to establish a dual UCF-KTU undergraduate program in public administration and nonprofit management that focuses on collaborations between citizens and the private sector. “Assuming all negotiations are successful, this will be another first-of-its-kind program for UCF such that participating students from both institutions will receive two bachelor’s degrees, one from each university, in four years,” Bryer said. 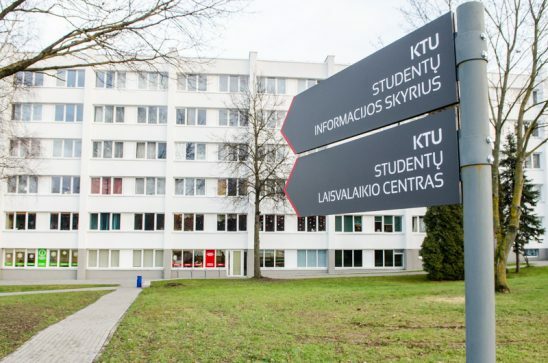 According to Eglė Vaidelytė, head of the KTU Committee for Public Governance Study Programs, students will spend their first two years of college at their own university; in their third and fourth years, they will join into one large group and spend part of their studies at KTU and part at UCF. “In such a way students will acquire not only the public-sector-governance knowledge but also will learn to work in a multicultural group [and] will develop their international communication skills, which are crucial to public administration professionals across the globe,” she said. To learn more about the exchange opportunities and the dual undergraduate program, contact thomas.bryer@ucf.edu. Also see KTU Public Administration Students Will Partly Study in the US.